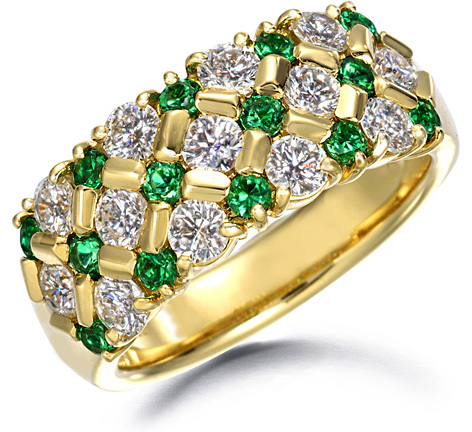 Fourteen 2-millimeter round emeralds and thirteen 2.8-millimeter round brilliant-cut diamonds are set in this ring using a combination of bar- and prong setting. Yellow gold accentuates the emeralds' color, and the brilliance of the diamonds produces a spectacular overall appearance. The emeralds are untreated gemstones from Sandawana, Zimbabwe or Bahia, Brazil that have not been impregnated with oils or other substances, making them especially rare and beautiful Gem Quality stones. The ring's height is kept low, and it is finished with careful attention to the finest details. This comfortable ring conveys a sense of both volume and elegance.